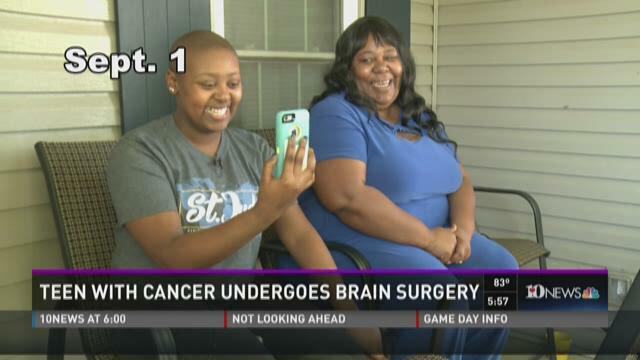 (WBIR - ALCOA) One Alcoa teenager made an unbelievable turnaround this week and is now thanking the community and her supporters for their prayers. 18-year-old Hannah Tate has a heart of gold and, as she'll tell anyone, a heart for God. She's battling Wilms' tumor, a form of kidney cancer usually found in people much younger than Hannah. WBIR first talked with Hannah in March, when she received a celebrity makeover surprise for her Alcoa High School senior prom. Earlier this month, WBIR caught Hannah's reaction on camera as a friend surprised her with news of a celebrity basketball game fundraiser to be played in her honor: the Slam Dunk on Kids Cancer Celebrity Game. That event is Saturday, in South Florida. But this week, just days before Hannah was set to fly down to Florida for the event, doctors discovered a tumor in her brain. Hannah underwent brain surgery early Wednesday in Memphis, and after some close monitoring, Hannah's medical team cleared her for the trip to Florida. She went from tumor discovery to airplane - with her doctor's blessing - in a matter of three days. "Thanks for your prayers we made it safely!!" Hannah's mom LaVetta Span posted on Facebook from Florida. The two flew down Friday morning, ahead of Saturday's Slam Dunk On Kids Cancer Celebrity Basketball Game fundraiser. Money from the game will go toward fighting childhood cancers. Hannah shares her journey on social media. People can request to follow Hannah Tate on Instagram HERE. Details on the fundraiser event are HERE.